Vazin, A., Fereidooni, M. (2012). Determining Frequency of Prescription, Administration and Transcription Errors in Internal Intensive Care Unit of Shahid Faghihi Hospital in Shiraz with Direct Observation Approach. Iranian Journal of Pharmaceutical Sciences, 8(3), 189-194. Afsaneh Vazin; Mitra Fereidooni. "Determining Frequency of Prescription, Administration and Transcription Errors in Internal Intensive Care Unit of Shahid Faghihi Hospital in Shiraz with Direct Observation Approach". 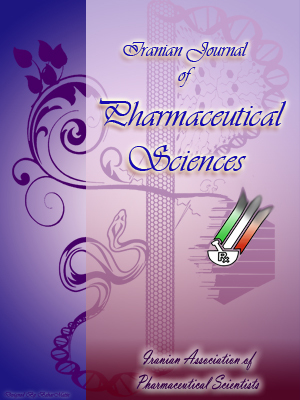 Iranian Journal of Pharmaceutical Sciences, 8, 3, 2012, 189-194. Vazin, A., Fereidooni, M. (2012). 'Determining Frequency of Prescription, Administration and Transcription Errors in Internal Intensive Care Unit of Shahid Faghihi Hospital in Shiraz with Direct Observation Approach', Iranian Journal of Pharmaceutical Sciences, 8(3), pp. 189-194. Vazin, A., Fereidooni, M. Determining Frequency of Prescription, Administration and Transcription Errors in Internal Intensive Care Unit of Shahid Faghihi Hospital in Shiraz with Direct Observation Approach. Iranian Journal of Pharmaceutical Sciences, 2012; 8(3): 189-194. Medication errors (MEs) are the most common error in ICUs. In fact, 78% of all serious errors in ICUs are due to MEs. Therefore, detecting MEs has vital significance. The goal of this study was to investigate the frequency, type and consequences of different types of errors including prescribing, transcribing and administration errors in an ICU of a large teaching hospital. Disguised direct observation method was used to detect errors. A pharmacy student observed 307 doses in 46 days of 6 h shifts. Observation data were entered in a form designed specifically for this purpose. Two hundred and fourteen MEs were identified in 307 doses. This is equivalent to 69.7% of total error. The error breakdown is as follows: administration errors 43.1%, preparation errors 24.1% and transcription errors 2.5%. Administration techniques and monitoring were determined to be the most common errors of MEs. Nearly, 89.4% of errors did not result in imminent danger to the patients. In the ICU under this study, the most common MEs were administration and prescription errors. To improve the quality of care in the ICU and reduce MEs, efforts should be directed to correct the wrong administration technique and inappropriate monitoring. The use of pharmacy department in drug preparation instead of drug preparation by nurses, using protocols for IV infusions, providing equipment and trained personnel for therapeutic drug monitoring and measuring medications level may help reduce suboptimal drug prescription and administration. Compared to the general hospital units, administration of dosage forms in intensive care units (ICU) is highly complex. There are several reasons for the higher frequency of medication errors (MEs) in ICU wards. First, in comparison with the patients in other hospital units, ICU patients generally need more medications . Second, most of drugs in an ICU are administered intravenously. Drugs prepared for intravenous injection require calculations . Third, because ICU patients are mostly in a low consciousness state, they are unable to report harmful effects . Fourth, compared to other patients, ICU patients are, in general, weaker physiologically. The aforementioned reasons, cause ICU patients to be considered highly vulnerable to MEs . MEs are defined as any preventable event that may cause or lead to an inappropriate medication use or patient harm while medication is in control of a health care professional, a patient or a consumer . In providing a dose of medication to a hospitalized patient 80-200 step must be taken . There is the potential for an error to occur at any of these steps. At any hospital, there are four broad stages in drug therapy. These stages include prescribing, transcribing, dispensing and, administrating . There were multiple studies on the importance and the rate of MEs in ICUs of Iran [6-10]. The objective of this study was to show the frequency, types and, consequences of nearly all kinds of MEs in an ICU of Shahid Faghihi a large teaching hospital in Shiraz. This study was conducted in a 10-bed adult medical ICU at a large teaching hospital located in Shiraz, Iran. Patients' medical treatments were under the management of pulmonologists, resident physicians and intern physicians from an associated medical school. Daily rounding of all patients in the aforementioned ICU was completed in the morning on a daily basis and the decision regarding the management of the patients were primarily made at time. Nurse-to-patient ratio was 4:5 or 3:5. Computerize physician order entry (CPOE) was not available in the ICU at the time of study and medication orders were handwritten by physicians. Verbal orders via the phone where accepted when the physician was not immediately available to write the medication order. In every shift, one nurse was responsible for transcribing the physician's orders to the nurses Cardex. An automated dispensing system was available at the unit There were no clinical pharmacy services and unit dose packaging available at the unit. The MEs were detected using the disguised -observation technique. The physicians and nurses were not aware of the research goal. The observer was a trained pharmacy student. The student was trained for a week at ICU to learn the principals of observation methods in ICU. The morning and afternoon shifts in the study was equally observed. The observer was responsible to attend in the rounds and then read patient's written order(s) and to shadow the nurse as he/she prepared and administered medications. During every shift of observations, the observer was directed to follow-up on only one patient. The outcome of research was not taken into account if the patient was discharged from ICU or expired less than 24 h from the time of ICU admission. All of the relevant data including patient information, physician orders, medications name, medications dose, time and administration of medication where entered on a form that was designed for this particular study. The data was validated via independent clinical pharmacist to insure the quality and accuracy. Errors were classified according to ASHP classification . The consequences of MEs rating from minor effects to fatal effects were categorized according to Hartwig et al. definition. The data was processed using SPSS software version 17 (SPSS inc.chigago,IL, USA). For the study of relationship between qualitative variables with each set of MEs data, we used Pearson chi-square and for quantitative variables independent sample t-test was used. Logistic regression was used for the impacts of determinants of mediation errors in medication error occurrence. The results are based on information collected on 307 prescribed doses to 27 patients during 46, six h shifts. The age range of patients was from 22 to 87 years. The average age of the patients was 47.87±19.90 years. Table 1 shows patients demographics and drug char-acteristics. On average, patients were hospitalized for 28.6±23.0 days and had an average of 22.1±7.5 medications per day (Table1). Two hundred and fourteen MEs were identified in 307 doses. This is equivalent to 69.7% error. The error breakdown is categorized as the following: aministration errors 43.1%, preparation errors 24.1%, and transcription errors 2.5%. Table 2 shows the frequency of MEs at different stages in the medication process, except wrong drug selection and wrong indication of use. The majority of errors occurred during administration stage. Most common administration errors included wrong administration technique and omission error. The percentage for both errors was 20.8% and 5.9%, respectively (Table 2). It is notable that the most common prescription error was monitoring error with 16.67% (Table 2). There was no difference between morning and evening shifts in terms of rates of MEs. Table 3 shows the severity of errors in different categories. Nearly, 89.4% of all error stages were not dangerous to the patient’s wellbeing. Tables 4 and 5 show the relationship between MEs with qualitative and quantitative variables. Table 1. Patient demographics (n=27), drug character-istics (n=307). Table 2. Frequency of all type of medication errors separately (number of errors: 214 from 307 doses of medications). *In prescribing errors category, since some medications need monitoring, the opportunities for monitoring of medications would be a number different form total doses of medications (147 out of 307 doses of medications needs monitoring, therefore we calculated the corrected percentage of monitoring errors. Table 3. Severity categories of observed medication errors. Unfortunately, in Iran the importance of MEs and reporting of such incidences is not given the deserved attention. Additionally, MEs are costly to the patients and their families . The number of investigations in the area of MEs in Iran is limited [6-10] thereby, there is a need to further investigate the MEs. This study was conducted in ICU of Shahid Faghihi, a large teaching hospital. Direct disguised observations were used for the study of MEs. Direct observation method has proven records of being a reliable way to investigate MEs . Reports form a study which has been conducted in 36 hospitals and skilled nursing facilities indicate that the percentage of errors were significantly higher when nurses were unaware of the study . Therefore, in this study observant was disguised and nurses were unaware that they were being watched. After conducting the study, the data indicated a 0.697% error per dose that was due to various MEs. Since they are many MEs and multiple definitions of errors, it is challenging to detect all forms of ME . The range or MES in the studies with direct observation approach is 3.3-72.5% . In this research, antibiotics were the most medications that prescribed for patients, however, the highest error was related to cardiovascular and central nervous system medications. In our previous  study, the highest error was related to antibiotic drugs. In a multinational study and a systematic review, the most MES occurred about antibiotics, sedative/hypnotics and cardiovascular medications [14-15]. In this study the frequency of MEs due to administration, prescription and transcription errors, were 43.1%, 24.1% and 2.5%, respectively. The frequencies of administration error were much higher than prescription and transcription error which is consistent with Krahenbuhlmelcher et al. study and another studies in Iran . Since the majority of prescriptions are administered by a single nurse, the administration procedure is prone to errors due to limited system check . In other MEs studies in Iran about errors in preparation and administration of intravenous medications, consistent with our study, the most common error in administration stage was about fast bolus administration and wrong infusion rate [8, 10], which signifies the need of further training of the nurses in Iran. The difference between our previous study  and this study related to medications with highest errors can be justified when it is considered that at Faghihi hospital's ICU only one nurse was administering medications to patients. This nurse was not responsible for anything else for patients. Therefore, the nurse had enough time to administer medications to patients. In comparison, at Namazee Hospital's ICU the nurse was responsible for other tasks besides administering drug. Prescription error was reported by our previous study  to be 41.1% which is much higher than our founding of 24.1%. This relatively big difference can be due to lack of consideration of indication error in this study. Van den bemt et al. studies MEs at combines internal medicine and surgery ICUs of two hospitals. At one of the 7 ICU beds hospitals that they studied, they reported 70.2% administration errors. That hospital had conditions similar to the conditions at the hospital under this study in terms of lack of protocols for the preparation and administration of parentral medications and unit dose packaging distribution system. In a study by Kopp et al. in an internal ICU transcription errors were reported to be 0.75 in each 100 drug dosage. In our study, the same error was 2.5 for each 100 drug dosage. However, in Kopp 's study , the responsible person for reading the prescriptions and entering orders into nurses' cardax was the department's secretary. Therefore, because only one trained person was in charge of reading prescription and was better familiar with doctors' hand writing and symbols used and because the person was responsible for potential errors, reading prescriptions was done with higher care. At the ICU that we studied each nurse at each shift who was responsible for giving medicaitons to patients was also responsible for reading prescriptions and up keep of patients file. Between all qualitative and quantitative variables, the length of patients' hospital stay and the number of drugs administered had a meaningful relation with the occurrence of MES (Table 5). This was predictable because the longer that a patient is hospitalized, the higher the potential for MEs. Also, the more the number of medications given to a patient, the higher the potential for errors . Although in our study the majority of errors (89.4%) did not result in any serious damage to patients, it is important to note that if MEs are not corrected and if errors are allowed to occur, they have the potential to cause serious medical issues. Therefore, one should not simply shrug off these errors even if they do not cause serious harm to patients. Necessary steps must be taken to prevent the occurrence of these errors. We faced several limitations in the course of this study. It is possible that observer may not record all MEs in the course of the study. Previous research and results of our direct-observation-based studies proves that occurrences of errors in direct observation method compared with volunteer-based reporting are more accurate [12, 14]. Another limitation is lack of any standard for determining MES. As a result we were not able to investigate all errors. Observer’s lack of access to interview patients to find out status of their health was among other limiting factors. The lack of access was due to patients being unconscious. Medication history of patients, help identify drug related errors. Errors such as drugs interactions, allergic reactions to drugs or, instructions not to take a drug(s) can be identified through medical/drug history of a patient. However, if such information is not recorded in patient’s file the incomplete information creates a limitation. Other limiting factors in this study included inability to collect data during midnight shifts. Normally, ICU patients have complex physical issues; therefore, even small error(s) may cause severe harm to them or may even result in their death. Preventing the vital MEs is a must and is only possible through investigations. Another effective tool in reducing medication error is to have a group of physicians, nurses and, pharmacists routinely investigate and discuss past episodes of medications errors in order to find ways to prevent such errors from occurring again. Also, increasing the number of nurses, reducing their responsibility and having protocols for intravenous infusion, can decrease MEs. Our special thanks go to Hassan Vazin, PhD and Zohreh Amoozegar PhD for their help with linguistic copy editing. This manuscript is extracted from the thesis written by Mitra Fereidooni. Cullen DJ, Sweitzer BJ, Bates DW, Burdick E, Edmondson A, Leape LL. Preventable adverse drug events in hospitalized patients: a comparative study of intensive care and general care units. Crit Care Med 1997; 25: 1289-97. Hussain E, Kao E. Medication safety and transfusion errors in the ICU and beyond. Crit Care Clin 2005; 21: 91-110. Ross L, Wallace J, Paton J. Medication errors in a paediatric teaching hospital in the UK: five years operational experience. Arch Dis Child 2000; 83: 492-7. Reason J. Human error: models and management. West J Med 2000; 172: 393-6. American Society of Health-System Pharmacist. Best practices for health-system pharmacy: positions and guidance documents of ashp: American Society of Health-System Pharmacists; 2005-2006. Vessal G. Detection of prescription errors by a unit-based clinical pharmacist in a nephrology ward. Pharm World Sci 2010; 32: 59-65. Fahimi F, Abbasi Nazari M, Abrishami R, Sistanizad M, Mazidi T, Faghihi T, Soltani R, Baniasadi S. Transcription errors observed in a teaching hospital. Arch Iran Med 2009; 12: 173-5. Fahimi F, Ariapanah P, Faizi M, Shafaghi B, Namdar R, Ardakani MT. Errors in preparation and administration of intravenous medications in the intensive care unit of a teaching hospital: an observational study. Aust Crit Care 2008; 21: 110-6. Khalili H, Farsaei S, Rezaee H, Dashti-Khavidaki S. Role of clinical pharmacists' interventions in detection and prevention of medication errors in a medical ward. Int J Clin Pharm 2011; 33: 281-4. Vazin A, Delfani S. Medication errors in an internal intensive care unit of a large teaching hospital: a direct observation study. Acta Med Iran 2012; 50: 425-32. Hartwig SC, Denger SD, Schneider PJ. Severity-indexed, incident report-based medication error-reporting program. Am J Hosp Pharm 1991; 48: 2611-6. Flynn EA, Barker KN, Pepper GA, Bates DW, Mikeal RL. Comparison of methods for detecting medication errors in 36 hospitals and skilled-nursing facilities. Am J Health Syst Pharm 2002; 59: 436-46. Wilmer A, Louie K, Dodek P, Wong H, Ayas N. Incidence of medication errors and adverse drug events in the icu: A systematic review. Quality Safety Health Care 2010; 19: e7. Kiekkas P, Karga M, Lemonidou C, Aretha D, Karanikolas M. Medication errors in critically ill adults: a review of direct observation evidence. Am J Crit Care 2011; 20: 36-44. Valentin A, Capuzzo M, Guidet B, Moreno R, Metnitz B, Bauer P, Metnitz P. Errors in administration of parenteral drugs in intensive care units: multinational prospective study. Brit Med J 2009; 338: b814. Krahenbuhl-Melcher A, Schlienger R, Lampert M, Haschke M, Drewe J, Krahenbuhl S. Drug-related problems in hospitals: a review of the recent literature. Drug Safty 2007; 30: 379-407. Moyen E, Camire E, Stelfox HT. Clinical review: medication errors in critical care. Crit Care2008; 12: 208. Van den Bemt PM, Fijn R, van der Voort PH, Gossen AA, Egberts TC, Brouwers JR. Frequency and determinants of drug administration errors in the intensive care unit. Crit Care Med 2002; 30: 846-50. Kopp BJ, Erstad BL, Allen ME, Theodorou AA, Priestley G. Medication errors and adverse drug events in an intensive care unit: direct observation approach for detection. Crit Care Med 2006; 34: 415-25. Camire E, Moyen E, Stelfox HT. Medication errors in critical care: risk factors, prevention and disclosure. CMAJ COMPLETE ABBREVIATION 2009; 180: 936-43.